Intern or volunteer with us in physical therapy in Costa Rica. Gain physical therapy experience while learning from some of the most friendliest and helpful therapists. Shadow and work under the supervision of well-trained and certified therapist. This placement gives volunteers/interns an opportunity to experience how being a physical therapist professional would be while expanding their knowledge of the field through hands on field experience. 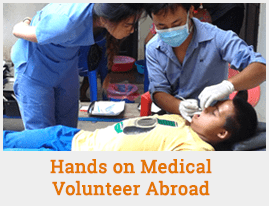 Volunteers in this project are typically placed in professional environments such as private clinics. Volunteers must be at least 18 years of age. Volunteers are expected to have health insurance. Volunteers must study basic medical and physical therapy terminology and verbs in Spanish before arrival. Beginner to intermediate knowledge of Spanish is preferred (but not mandatory). If a volunteer cannot speak Spanish, we suggest that he or she enrolls in our Spanish language program. Volunteers must have a desire to learn and gain experience in the physical therapy field. Volunteers should be pro-active, hardworking, dedicated, respectful, professional, open-minded, eager to learn, flexible, patient, and to possess a passion and love for the volunteer service they are providing. Volunteers in this project will be expected to be be professional at all times as well as respectful and self-starters (able to recognize what needs to be done or who needs to be helped). Volunteers will help assist and learn from a certified physical therapist at their practice. Volunteers are placed to learn through experience and shadowing in a safe and professional atmosphere. Volunteers will attend to patients varying needs. Participants have the option to either stay with well-screened host families or at our headquarters depending mainly on availability and preference. Should participants have a preference, they should let our in-country coordinator know as soon as possible-in their application. We try to accommodate preferences. Host Families are well-screened and offer participants a shared bathroom, private bedroom, electricity, and running water. Headquarters housing offers participants shared bathrooms, hostel-style bedrooms, electricity, running water, and WiF. Participants receive three light traditional meals per day at either accommodations..